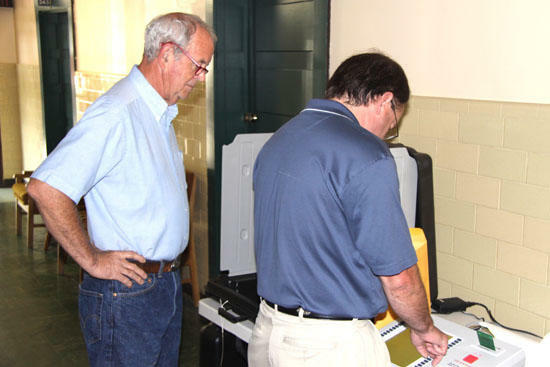 Cannon County Administrator of Elections Stan Dobson watches as machine technician Fred Fann checks out a voting machine Tuesday. Cannon County has the second highest number of candidates on the ballot for the August 5 General Election and State Primary in the state of Tennessee, so it is especially important that all voting machines to be used in the election are in proper operating and working order. To that end, two machine technicians — Fred and Glenn Fann — are spending many hours today at the Cannon County Election Commission Office doing a complete trial run, testing the machines and their output as though it were the actual election. "We check the function of the machines to make sure they are operating properly and the ballots to make sure they are correct," Fred Fann said. "And on a certain percentage of the machines we make sure that it is possible to cast a vote for every candidate on the ballot." The machines are the actual ones which will be used in early voting and on election day. In other election news, there will be a meeting of the election commission tonight at the Cannon County Courthouse beginning at 5:30. Citizens and candidates are encouraged to attend to ask questions or express concerns about the election. Early voting will begin July 16 and end July 31. Election Day is Aug. 5.